NEW YORK — From Facebook to Snapchat, U.S. social media giants are starting to borrow from Tencent Holdings‘ playbook, rolling out one after another update reminiscent of the Shenzhen-based company’s flagship product, WeChat. WeChat, the messaging app boasting over 1 billion daily active users, is often known as the original “super app” — a mobile platform offering myriad features, from ride hailing to wealth management, which users can access without having to leave the app. Los Angeles-based Snapchat, which Tencent holds a stake in, has just introduced Snap Games, allowing users to play in-house or third-party video games with friends without having to exit the app, much like mini games launched on WeChat in 2017. Wall Street, which has long been concerned with Snapchat’s ability to turn a profit, reacted positively to the change, pushing parent company Snap’s stock higher after the announcement. Connie Chan, a partner at Menlo Park, California-based venture capital firm Andreessen Horowitz, said that while historically there was little English coverage on Chinese tech from a product and strategy perspective, large U.S. tech companies are now starting to take note, partially because the likes of Alibaba Group Holding and Tencent have demonstrated their clout through strong market caps. San Francisco-based online forum Reddit began testing a tipping feature that would allow users to make payments to authors of posts, following a $300 million funding round led by Tencent. The option to tip a content publisher has been available on WeChat’s publishing platform on and off since 2016. Matthew Brennan, a Shenzhen-based tech analyst, said Tencent as an investor brings industry expertise to the table — besides just capital — for companies like Snap and Reddit, which have to compete with larger U.S. players such as Facebook. The largest U.S. social media company by market capitalization, Facebook also looks to be taking hints. Last month, Facebook CEO Mark Zuckerberg unveiled a “privacy-focused vision” for social networking, centered on a private messaging-based platform that will also offer calls, video chats, stories, payments and commerce. Two weeks later, its subsidiary Instagram rolled out an in-app e-commerce feature for select retailers. Earlier in 2015, Facebook added a payments feature to its instant communication tool Messenger, one and a half years after Tencent. Facebook declined to comment when asked if they had studied the WeChat model. In China, many mobile users have long grown accustomed to completing various tasks within WeChat’s platform. Without leaving the app, users can complete various tasks such as making a purchase or booking movie tickets, services provided by Tencent’s own portfolio companies including Nasdaq-traded Pinduoduo, as well as other businesses. The technology has paid off enormously. According to a 2018 report by Beijing-based data research company QuestMobile, 47.3% of China’s total time spent online on mobile could be attributed to Tencent. In earlier years, Chinese social media platforms were not known for their innovation, with the first players in the space being mostly ripoffs of Western counterparts. Tencent’s instant messaging platform QQ was an answer to then-popular ICQ (later acquired by AOL) and Microsoft’s MSN. Renren.com, the Chinese equivalent of Facebook, enjoyed huge popularity in the latter half of the 2000s but flopped when Tencent’s WeChat took over by storm, starting a mobile revolution. That was when the tide started turning. “Mobile first and mobile only, I think, is the overarching theme of China — also the idea of experimenting different business models outside of advertising, which you’re starting to see very early signs in the West,” Chan said. Chan explained that by being mobile-first, Chinese social media was forced to experiment alternative monetization techniques very early on, with advertisements being less appealing on a phone compared to a computer. The super app, which minimizes the taps needed for each action, thereby improving user experience, also stems from the mobile-first principle, she said. Fierce competition and consumers readily embracing new practices and models also pushed Chinese companies to innovate faster and better, according to Chan. “Consumers in Asia are, on a margin, more experimental when it comes to accepting new features or tolerating constant changes to the user experience,” she said. Michael Pachter, an analyst who covers Facebook and Snapchat for Los Angeles-based Wedbush Securities, said it makes sense for companies like Facebook and Snapchat to emulate what has worked in China. Besides Facebook and Snapchat, some smaller companies are also learning from Tencent — and they are not hiding it. In 2014, Ted Livingston, CEO of Canadian messaging service provider Kik declared his ambition to make Kik the “WeChat of the West.” Tencent became an investor in Kik the following year. Analysts warned, however, that Western companies will not be able to simply copy and paste the WeChat model, due to different consumer and regulatory environments. “If we didn’t have anti-trust rules, I think Facebook would have bought everybody up” and become a super app, Pachter said. “It’s important for an entrepreneur studying Asia to know which things translate, and which things are very much a function of Chinese or Asian culture,” said Andreessen Horowitz’s Chan. After being separated from her friends, she decided to call an Uber to take her home. After all, that was the responsible thing to do, she thought. The woman just wanted to get home safely. She had been attending a social gathering in Los Angeles on Dec. 20, 2017, where she had consumed alcohol. After being separated from her friends, she decided to call an Uber to take her home. After all, that was the responsible thing to do, she thought. A car pulled up, and she got in. But she noticed something odd, according to court documents: The license plates did not match the Uber ride. Her driver claimed he had damaged his car and had not updated the app with his new information. The woman, named only in court documents as “Jane Doe 2,” is one of three who have filed a lawsuit against Uber Technologies in Los Angeles Superior Court. The lawsuit alleges the ride-hailing app left them “sitting ducks” to men in Los Angeles who posed as Uber drivers to sexually assault female passengers. It also suggests Uber knew fake drivers were preying on women but did nothing to warn customers. The lawsuit was filed Friday, just a week after a college student in South Carolina was picked up by a car she mistook for an Uber, whose driver, police say, killed her and left her body in a field. Two other women, named as Jane Doe 1 and Jane Doe 3, say they were also raped in separate incidents by a man who they believed had been the Uber drivers they called to take them home from Los Angeles-area nightclubs. Jane Doe 1 and Jane Doe 3 were said to have been raped by a man named Walter Velasquez, who was recently sentenced to eight years in prison after posing as an Uber driver to assault women. The complaint alleges Uber knew about fake drivers preying on women around Los Angeles as early as 2016 and that the Los Angeles Police Department or sheriff’s department had contacted the ride-hailing service about the problem. But the complaint says “it intentionally withheld this information” from the women and “did nothing to warn” them of danger. FEM Law Group, which is representing the women, declined to comment on the case. Uber would not comment on the lawsuit, but said in a statement to The Washington Post it had been working to inform riders of potential risk. To prevent customers from getting in the wrong car, Uber has cautioned riders to wait inside rather than stand on the street with their cellphones open and to check the license plates and driver photos of their assigned ride against the drivers who come to get them. The company said it had worked with Los Angeles law enforcement as well as bars in the city to prevent dangerous mistakes. The LAPD declined to comment on the case or on Uber’s involvement with law enforcement. The ride-hailing company, as well as similar services like Lyft, is facing increased scrutiny in recent weeks after the death of Samantha Josephson, a 21-year-old college senior who called an Uber to take her home from a bar in Columbia, S.C., but got into the wrong car. Authorities have charged 24-year-old Nathaniel D. Rowland with kidnapping and killing her. Her death made national headlines and prompted calls for the companies to increase their safety features. South Carolina’s legislature passed a bill on Tuesday that would require Uber and Lyft drivers to display illuminated signs that clearly identify them. After Josephson’s death, Uber said it would issue another public safety awareness campaign called “Check Your Ride” and would publicize safety tips on social media, in college papers and within the app. It also said it would send “Check Your Ride” reminders to customers as they were being picked up. About FastPay. FastPay is a financial technology platform that reduces friction and unlocks capital for buyers and sellers across the media landscape. 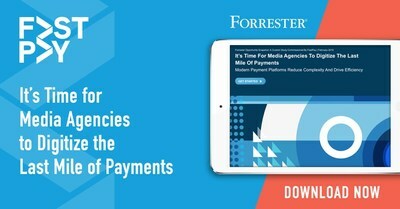 LOS ANGELES, April 2, 2019 /PRNewswire/ — FastPay today released a commissioned study conducted by Forrester Consulting entitled “It’s time for media agencies to digitize the last mile of payments,” describing the consequences of manual payment platforms, specifically for finance departments of media agencies. This study surveyed 154 agency AP professionals and found that sixty-four percent of accounts payable respondents agree paying invoices by check is exceedingly time-consuming. Yet, media agencies still make nearly one-third of payments by check, resulting in late payments, lost or stolen checks, and additional labor costs. Checks aren’t the only concern. Other payment methods come with drawbacks when processes aren’t automated. Finance departments that manually enter payment information into media suppliers’ online portals experience manual errors, delayed payments, and slow, inefficient reconciliation. “It’s challenging enough working with manual, inefficient payment processes, but on top of that, agencies have to keep up with changing vendor payment terms, ownership, and check destinations, since the industry constantly evolves. As the media industry continues to be at the forefront of digital transformation, finance departments need to keep up,” said Michael Wehner, General Manager and Senior Vice President of FastPay. This study examines the intricacies of the payment process and how the industry is entrenched in cumbersome legacy payment processing methods and extended payment terms. Forrester suggests that the final stretch of ad purchasing should be digitized for better payment accuracy, process efficiency, and cost savings. “The reason I started FastPay is to directly solve for these kinds of issues. Coming from a background in media and finance, I witnessed firsthand the challenges associated with slow payments. Our solution is designed specifically to address these key challenges by bridging the gap between agencies and suppliers through workflow efficiency and media specific technology,” said Jed Simon, Founder and CEO of FastPay. Bottom line: manual payment processes are holding media agencies back. Agencies that have digitized the last mile of payments are saving time and money, increasing revenue, and improving relationships with vendors. As more media agencies modernize their AP toolset, the entire media ecosystem will benefit from more efficient payment transactions and less friction between agencies and suppliers. For more information, access the full study here. FastPay is a financial technology platform that reduces friction and unlocks capital for buyers and sellers across the media landscape. Since its inception in 2009, FastPay has secured the movement of more than $6B in capital providing access to hundreds of millions of dollars in deployable capital from partners including Citibank, Wells Fargo, and Oak HC/FT. Its leadership team brings decades of credit and payments experience from Green Dot Corporation, Capital One, Morgan Stanley, Goldman Sachs, and Skrill. Headquartered in Los Angeles, FastPay has offices in San Francisco, New York, London, and Framingham, MA. For more information, please visit www.gofastpay.com. LOS ANGELES, April 2, 2019 /PRNewswire/ — Wedbush Securities is pleased to announce the appointment of Laura Chico, Ph.D., Senior Vice President of Equity Research on the Healthcare and Biotech team. Her addition to the firm’s expanding Equity Research group represents the firm’s commitment to extending the company’s footprint in the Healthcare and Biotech sector. Laura is based in Wedbush’s Chicago office and reports to the firm’s Executive Vice President and Chief Administrative Officer, and interim Director of Research, Don Hultgren. Laura holds over a decade of experience in the biotechnology and drug discovery industry, as well as nine years in Equity Research. Prior to joining Wedbush, Laura served as Vice President of Equity Research at Raymond James, and before this was a biotech analyst in the Robert W. Baird Equity Research Healthcare group. Before entering equity research, Laura held scientific roles in both industry and academic settings with focus in central nervous system (“CNS”) diseases such as Alzheimer’s disease. Laura Chico’s addition represents Wedbush’s decades-long commitment to its Healthcare and Biotech practice, since its acquisition of Pacific Growth (“PacGrow”). Laura adds her expertise to the influential and robust team that includes David Nierengarten, Ph.D., Liana Moussatos, Ph.D., and Robert Driscoll, Ph.D.
Laura received her B.S. in Bacteriology from the University of Wisconsin-Madison, her M.S. in Computational Biology & Bioinformatics, and her Ph.D. in Molecular Pharmacology, from Northwestern University. She continues to serve as an adjunct assistant professor at Northwestern University’sFeinberg School of Medicine. LOS ANGELES (KABC) — Rideshare company Lyft will invest up to $50 million in cities where it operates, including Los Angeles, the company announced Friday. The company made the announcement with L.A. Mayor Eric Garcetti. Lyft says it will invest $50 million, or 1 percent of its profits – whichever is larger – to support local transportation initiatives. The investments will happen in every city where Lyft operates. In L.A., Lyft will support Garcetti’s “A Bridge Home” program, which partners with the YWCA of Greater Los Angeles, PATH, and The People Concern. Garcetti said he was thrilled to partner with a company that prides itself on transforming transportation. “We’re proud to stand alongside Mayor Garcetti and civic leaders in Los Angeles to launch Lyft City Works, which represents our long-term commitment to support cities across the country with sustainable, accessible, and connected transportation solutions,” said Lyft General Manager of Southern California Allen Narcisse in a statement released by the company. The announcement came on the same day Lyft became a publicly traded company.